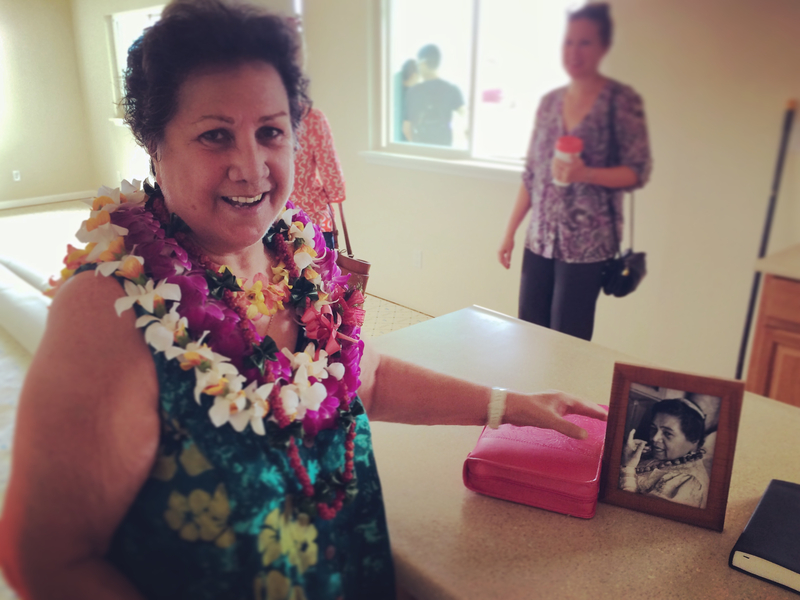 Darleen Kaniho poses in her newly rebuilt home alongside a picture of her māmā Ida Naone, who raised her on this very same homestead lot in Papakōlea. PAPAKŌLEA, OʻAHU – Aging infrastructure and a reluctance to leave a lifetime of memories behind had homesteader Darleen Kaniho living in uninhabitable conditions for several years in her childhood home in Papakōlea. With the help of Honolulu Habitat for Humanity, Darleen was able to rebuild on her ʻāina hānau with memories intact. Darleen’s newly rebuilt home in Papakōlea. Today, Darleen received the keys to the rebuilt 2-bedroom, 1-bathroom home at the corner of Krauss and Iaukea Streets. In less than 200 days, Habitat partners, staff, and volunteers were able to rebuild Darleen a new, much safer home. 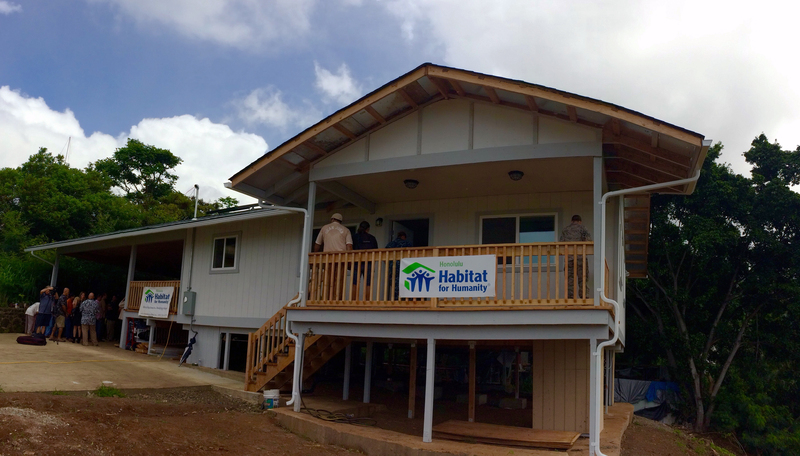 This is Habitat’s first completed home of 2016, and the 77th rebuild since 1988. Aging and sometimes dilapidated homes in our older homestead communities like Papakōlea are one of the toughest challenges for homeowners, especially kupuna, who may not have the know-how or savings to complete costly repairs, let alone a rebuild. 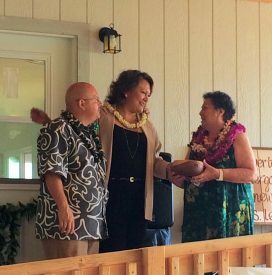 Honolulu Habitat’s Executive Director Jim Murphy joins DHHL’s NAHASDA Manager Niniau Simmons in presenting makana to Darleen at her home blessing ceremony. Partners like self-help home construction powerhouse Habitat for Humanity Honolulu allows the Department of Hawaiian Home Lands (DHHL) to leverage federal funds with Habitat’s stellar network of volunteers and construction industry professionals to provide safe, affordable housing to kupuna like Darleen. Darlene was able to secure a zero-interest construction loan for the rebuild through DHHL’s NAHASDA (Native American Housing Assistance and Self-Determination Act) program. Federal funds under NAHASDA also helped pay for a retaining wall for Darleen’s new home.